This workshop will present soft and high tech communication strategies that support even the most challenged student in their communication growth and literacy development. CLOSING THE LEARNING GAP FOR ALL COMPLEX KIDDOS, STUDENTS AND PATIENTS- ALL ENGAGED, ALL COMMUNICATING ALL LEARNING! Students and patients with complex disabilities are often challenged to communicate, engage and learn. Teachers and therapists can be puzzled as how to best build communication with those who are nonverbal and severely motor challenged. Academic and therapeutic instruction can be difficult in light of these obstacles. This workshop will present soft and high tech communication strategies that support even the most challenged student in their communication growth and literacy development. Demonstration of academic supports and strategies that help aid learning to read and write will help students that often get left behind in these areas. Robust videos will highlight strategies and methodologies. Participants will leave with specific strategies for supporting our most complex learners and a renewed belief in their patients’ and students’ underlying abilities, regardless of their diagnosis! 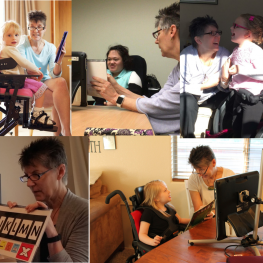 Requesting is an easy and concrete strategy that we often use when first introducing Augmentative and Alternative Communication (AAC) solutions to individuals with significant communication challenges. But, what happens next? What happens when we run out of things to request? What happens when the AAC user seems bored and unmotivated? When we assume competence, it is imperative that we move AAC users to higher levels of communicative competence. In this session, we will discuss strategies for developing skills that move beyond requesting … into the world of asking questions, making comments, protesting, expressing opinions, and other communicative functions. We will use lecture, discussion, and video examples, to explore the power of various communicative functions, vocabulary selection, teaching strategies, and specific ways to support communication beyond requesting. THANK YOU TOBII DYNAVOX FOR PARTNERING WITH US!